Let’s keep it live and just move from Holland (Curtis Mayfield) to Switzerland! This entry was posted on Tuesday, March 11th, 2008 at 10:07 pm. It is filed under Funky Beats and tagged with 1876, Jaco Pastorius, Live, Montreux, Weather Report. You can follow any responses to this entry through the RSS 2.0 feed. dope incidental music while driving indeed! Hey, thanks for this one. been diggin’ WR all over again. In short the more I hear today’s music the more I think the 70s is where it is at, or at least was b/f commerce trumped creative expression. 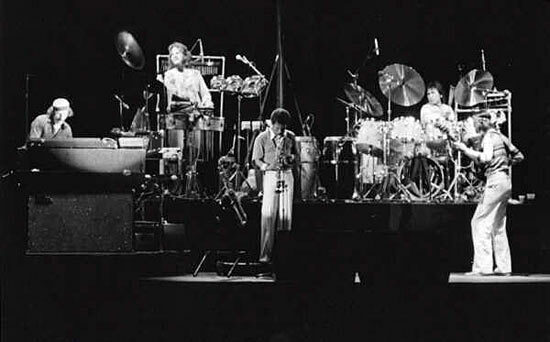 they are posting 5 live shows from the various years (6 if you include the re-up “Chateauvallon, France, August 24, 1973″) entitled “WEATHER REPORT – The ’70s Concerts Series”. From Miroslav to Jaco this collection KILLS! quite simply, a must have! each edition up for a week or two at best. do not snooze on this! Hey mr x, many thanks for the link. I will check this 5 live shows for sure. already forwarded this to my father, this is going to make him happy!! and I’m also checking it for myself. qui a Mosca fa un caldo assurdo, ieri notte c’erano 17 gradi, abbiamo dormito con la finestra aperta! una domanda: sei riuscito a beccare altri concerti dei WR? mio padre ci ha preso gusto… e quei 5 concerti di cui si parlava sopra gli hanno fatto venire l’acquolina in bocca! nel caso mandami una mail. Jaco Pastorius would be proud to hear the bass chops of jazz artist Alessandro Bottura. His latest record, “Morning Grooves” is a smooth fusion of rock, jazz, and pop instrumentals all rolled into one amazing sound. Bottura’s bass playing speaks for itself and is immediately evident right from the opening track, “Out of Sight.” His jazz fueled bass runs fly up and down the neck and are nicely driven by some outstanding guitar/drum work. Bottura changes gears a bit and slow things down on “Sweet Tears,” which also highlights his staccato playing skills. Any fan of Jaco Pastorius or of virtuoso bass playing will love this album, plus the band behind Bottura is just as exceptional as he.